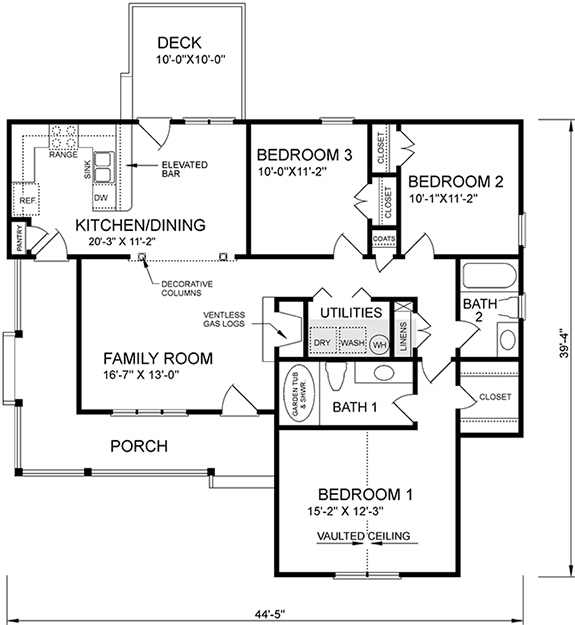 Home is truly where the heart will be while you�re enjoying the charming atmosphere of this three-bedroom design. 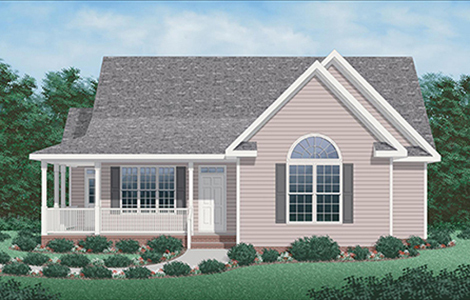 Beyond its affordable elegance, you�ll find pleasing features and generous amenities for daily living: An L-shaped front porch, nested gables, special windows, and transom lights all contribute to an attractive exterior. The open layout of the main living areas provides easy traffic flow while creating a feeling of spaciousness. A fireplace adds warmth to the generous living room area. Decorative columns grace the transition from living room to dining area. The kitchen/dining room combination offers a highly functional area with a pantry, a serving bar, and quick access to the back deck for outdoor meals. Nine-foot-high ceilings enhance the feeling of space throughout the home. A large utility closet minimizes noise from washer and dryer The master bedroom offers a fine retreat with its designer window, vaulted ceiling, walk-in closet, and private bath with garden tub/shower.